towards Marseilles or Highway A50. 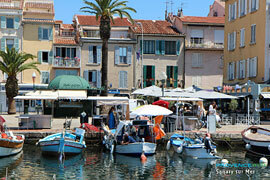 As you arrive on the picturesque quay you will tall in love with this Provençal village. The Mediterranean atmosphere is everywhere: in the colorful façades, the lively streets, terraces shaded by palm trees, and the daily flower market that is held outside the town hall. From the top of Notre Dame de Pitié there is a magnificient view of the islands Embiez, Rouveau, Pointe Negre, and the red rocks of the rough coastline La Cride. The shoreline path has been set up for those sports-minded visitors who like a challenge to their walks. 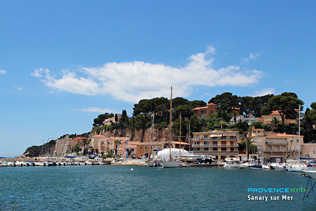 Beach lovers will be delighted to know that due to 280 days of sunny weather in Sanary, swimming is an every day activity here from May to October. Every year the town organizes carnavals, evening crafts markets io the summer, and festivities such as bouillabaisse days, sardine days and other special events. The tropical plant collection at the exotic gardens. 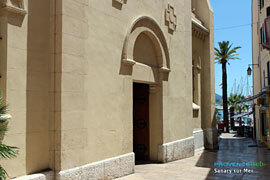 Shows at the Galli theater. Scuba diving school. Deep sea fishing. 5 Tennis clubs. l Squash cIub. 3 Fitness and relaxation centers. 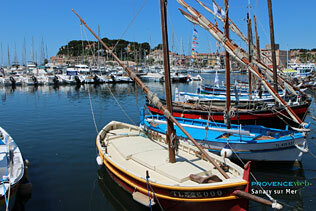 Bandol (4 km), Ollioules (6 km) and Six Fours les Plages (4 km).